Are You June's Soldier of the Month? Enter Here! 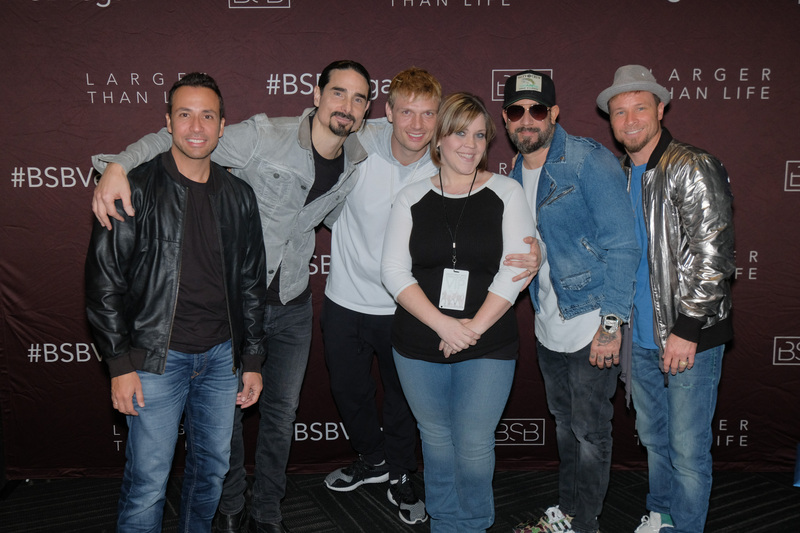 If you’re active in the Backstreet Boys family, you’ve probably seen the username “Shipmom.” That would be none other than Marge, a mother from Washington state who loves the Backstreet Boys. For the May 2017 Soldier of the Month contest, we had other fans nominate someone who they thought deserved to be Soldier of the Month on BackstreetBoys.com. Marge was nominated by Amber, better known to most as @Yahtzee27 on Twitter. The two first met in 2013 at the Backstreet Boys’ 20th-anniversary celebration and Walk of Fame ceremony. The mother of three became a fan in the mid ’90s, but it was the 1998 MTV Spring Break performance in Cancun that had her hook, line, and sinker. And while she loves all five of the boys, one does hold a special place in her heart and her friends know it. Marge is also no stranger to the Backstreet Boys cruises, having won a contest from the Backstreet Boys in 2011 to be on the cruise that year. Now meet Marge Shipman, aka “Shipmom,” your May 2017 Soldier of the Month. What do you do for a living? I’m a full-time mom to my three great kids. I also am a substitute para-educator for our local school district. Tell us a little bit about yourself: I’ve been married 17yrs this month to my husband Morgan. I’m a mother of three great kids. My oldest is Nick (15), and twins Alex & Aurora (13). At 24yrs old, I was diagnosed with an auto-immune disease (similar to Lupus) called Wegener’s Granulomatosis. I’ve been in remission since 2010. We are a family full of Asperger’s & ADHD and BSB is an everyday part of my families’ life. I was blessed to be able to take my entire family in May 2015 for a Meet and Greet in Seattle, Washington with the boys. How long have you been a BSB fan? Since 1995, but I heavily started in 1996. I had just gotten my license and my first song played on my first official licensed drive was Quit Playing Games! What is your favorite BSB memory? 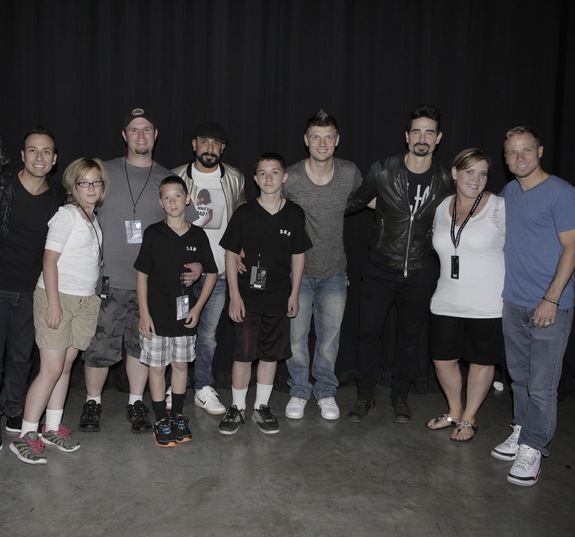 My most favorite Backstreet memory would have to be my last few Vegas experiences. I ran into Howie unexpectedly at the Vegas airport. I had done Meet & Greet Opening night and as I walked away I hear someone say, “That was Shipmom.” I walked back and said, “Did someone say my name?” Howie looks at me, winks and points at me and says, “You’re Shipmom, I got you.” He had called me that a few times before but I have never believed what I had heard. Still seems like a dream. I stayed for the Friday night show and was recording the boys singing Shape of My Heart. I had seen from the first show that they give someone a rose. I figured if I recorded it I could send the video to the lucky sweetheart that would get it. Instead, I recorded my own special moment and Howie handing me his rose. Then on the 24th Anniversary, my husband had gone over and talked to Howie. Moments later, Howie walks over to where I was sitting. He talked, I listened. The moment ended with a hug and he returned to have his dinner. I couldn’t hear our conversation we had very well at first, but luckily my husband recorded it for me. What is your favorite BSB song and why? “EVERYBODY.” I know “As long as there’ll be music, they’ll always be around.” They are an every day in my life. Without them I’m incomplete. What is your favorite BSB video and why? I have two. “Larger Than Life.” The hover boards were awesome, it reminds me of their first concert I had ever been to. The dance at the end is my favorite when they side hop, arms extended out like slanted airplane wings. My second is “Show Me the Meaning”. It means the most to me and makes me cry anytime I hear it. It most recently reminds me of my beautiful pug princess Layla who I unexpectedly lost in October. I got to hold her for a short while after and played five backstreet boys songs at the vet while I said my goodbyes. It reminds me of how much I miss her and wish I could be with her, and how she’s missing in my heart. It also reminds me of myself. I had always worried I’d be the one in the red dress running towards my family (Howie) because of my auto-immune disease. Who is your favorite Backstreet Boy and why? I love all five of the Backstreet Boys. Being a mom to my kids I can’t say I love one more than another or have a favorite. I love them all. HOWEVER, there is one special boy that has made every experience I’ve ever had with him more personal, compassionate, special, and memorable. Howie D! He’s taken the time to know who I am. Know my name, associate me with my family or past interactions we’ve had. How has BSB impacted your life? They are a daily therapy. Their music has been a part of all my life’s major events. From driving to dating my husband. I bought the “Millennium” album and was so excited I drove straight over to where my husband was working at the time just to show him I had the album in my hands. I stood outside in the cold waiting for the Payless store to open to get the best seats from Ticketmaster. I named my sons after them. My oldest Nick and youngest Alex. Ironically both are opposite of the boys. Nick has dark hair, and Alex had bleach blond hair. When I hear their music start playing in the middle of the store I have to stop what I’m doing and start dancing. I have to listen to the song finish playing before I can leave. When I hear their music it makes me smile and feel better about myself. It’s one of the shining lights as I’ve struggled with self-esteem all my life. What is your favorite thing about being a BSB fan? Being part of positive experiences, making memories, being remembered and being recognized by the boys. When family and friends think of you when they hear anything Backstreet Boys related. Making friends with people because of the love for the boys. When you see the boys smile it brings such a warm feeling over your body. Are you heading to Vegas this summer to see the boys? If you already have, what did you think of it? I’ve already seen the Vegas show 4 times. I went to the very first 2 shows March 1st & 3rd and then two more times during the BSB anniversary week on April 19th & 21st. The show is filled with harmony, lasers, lights, dancing, and props. It’s a mix of Traditional Backstreet Boy moves, Techno, Do-wop, and is truly Larger than Life. The intro to the entire show hypes you up so much you’re screaming before the curtain is pulled and you see the boys themselves. The dancers are great too. It’s fun to watch them dance while the boys change their wardrobe. I wish everyone could go see them. They are worth every moment being there. I would love to go back again. After reading the reason for being nominated, how does that make you feel? Why do you think it's important, as a fan, to look after other fans and make sure that their dreams come true, too? Do you feel that other fandoms do that as much as the BSB fandom? I feel honored to be nominated. I really do worry about everyone else and hope they are having a great time and getting the best experience. I’ve been blessed to have my interactions with the boys. I know what joy that brings me and I think that everyone should have that feeling at least once. It’s important for us fans to watch out for each other because we are a FAMILY. It’s the relationships and memories we create together in this FANmily that help us grow and give tips to help guide our fellow fans to have their dreams come true with these boys. I don’t think any fandom is like the BSB fandom. Backstreet Boys are still going strong, Larger than Life and Unbreakable. The fans have proven that from the sell-outs of residencies, cruises and following them around the world that we aren’t going anywhere either. Are you going on the 2018 cruise? How many cruises have you done? What's your favorite thing about them? We’ve gone on 3 BSB cruises. 2011, 2013 & 2014. I was at the concert in Vegas when they announced the cruise. People asked if we were going, and my husband said “YES”. That Sunday of the cruise, May 6th will be our 18th Wedding Anniversary. What better way to celebrate together than on a cruise with our friends and the Backstreet Boys. I love the sea. We are Shipmans! We belong on ships and on the sea. It’s soothing, fun, and exciting. The boys are there. The chance you might get to see them passing by, or speak to them, wave and say hello. It’s a magical thing. Spending time with your friends who you’ve gained from this wonderful fandom, and new fans you meet there too, it’s a wonderful experience. I wish everyone could be there.